A £19m scheme to support existing and new businesses in south west and mid Wales has been launched. Almost 2,000 grants of up to £5,000 are initially available in five counties - Carmarthenshire, Ceredigion, Swansea, Pembrokeshire and Neath Port Talbot. Each company would later be eligible for a second grant and there are claims it could create about 1,000 new jobs. It is the first local council-led project to win EU Convergence support, which replaces Objective One funding. 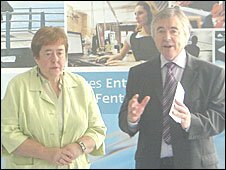 Launching the scheme at Llanelli's new Delta Lakes Enterprise Centre, Deputy First Minister Ieuan Wyn Jones said: "This is a £19m scheme - it's excellent news for you here in the south west. "It is the first local authority-led scheme to be approved under the new Convergence programme and it is the first of many I expect to coming through the pipeline very shortly indeed. "What it will enable you to do is support up to 2,000 businesses - some start-ups, but the majority perhaps existing businesses - so that they can have some capital support to enable them to move forward." Among those present at the launch were business people who had benefited from similar funding in the past. Richard Thomas of Llanelli-based Atech Graphic Design said small grant funding had helped his company expand since starting-up in 2001. "It has helped us purchase machinery which has allowed us to tender for certain contracts. "One is to become Carmarthenshire Council's sign supplier and another is to manufacture the new Scarlets' Stadium signs." Now employing seven people he said without the grants they would not have expanded on such a scale. Mari Thomas, whose business specialises in designing and producing gold and silver jewellery, said a marketing grant had helped her exhibit internationally in cities including New York and Tokyo. "It has made a fantastic difference to my business showing my products internationally. "I don't think I would have been able to operate on an international stage so confidently without it."